ISDATE() - Checks if the given value, is a valid date, time, or datetime. Returns 1 for success, 0 for failure. Note: For datetime2 values, IsDate returns ZERO. Select ISDATE('2012-09-01 11:34:21.1918447') -- returns 0. Select DAY(GETDATE()) -- Returns the day number of the month, based on current system datetime. DateName(DatePart, Date) - Returns a string, that represents a part of the given date. This functions takes 2 parameters. The first parameter 'DatePart' specifies, the part of the date, we want. The second parameter, is the actual date, from which we want the part of the Date. 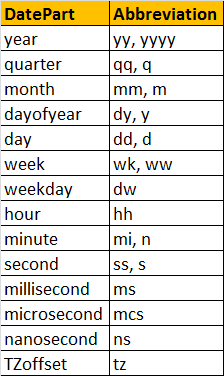 A simple practical example using some of these DateTime functions. Consider the table tblEmployees. Write a query, which returns Name, DateOfBirth, Day, MonthNumber, MonthName, and Year as shown below. This is very excellent tutorial and teaching. Keep this up. I have watched so many tutorial but no one can teach like you. Excellent. I woul like to find out where would i get how to insert dateofbirth, age into the already exciting table? I love watching your videos, you make everything so easy to understand! Thank you so much for all your time and effort!